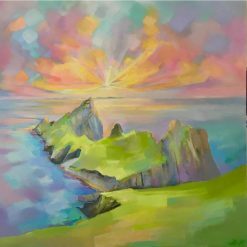 Born and bred on the Westside of Lewis, DK works from his studio in the village of Shawbost and displays his work at local and national galleries. 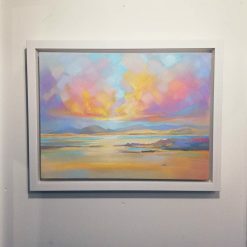 DK studied Art and Design at the University of the Highlands and Islands, North Uist campus in 2004 but since completing the course, has been largely self-taught. 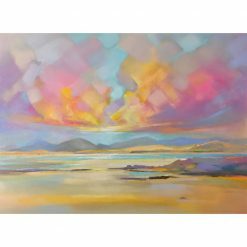 He has spent the subsequent years developing his style which has led to a slow evolution as experimental brush work has given way to a more assured understanding of his tools and process. 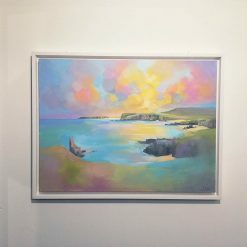 The landscape on his doorstep is the biggest inspiration for his work and he captures the Western Isles in his own interpretation. 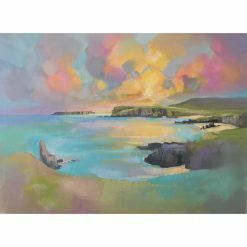 The coastal beauty looks familiar, yet otherworldly, cast into a different dimension of colour and reflection that excites and intrigues. 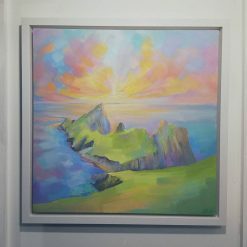 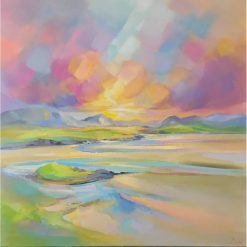 DK’s subject is predominantly the land, sky and cloudscapes in his native Scottish islands and he paints in acrylic and oil to create shape, texture and light. 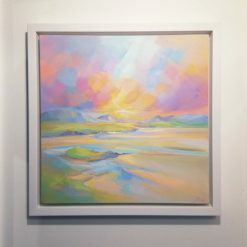 DK spends most weekends at the beach, photographing, sketching and capturing ideas to develop back in the studio.